This is a new mod I've been working on for quite a while now - finally it's ready for release! This mod is mostly meant for fort mode - although for adventure mode players, some of the intelligent underground creatures are available for playing from fortress civs. Each layer has many predators, non-hostile creatures, and vermin - aside from that, all of them also have several rare but powerful "boss" type creatures, somewhat analogous to the Cave Dragons in vanilla. I've designed most of them, though some are just based off of common "tropes" like cave worms. The simplest layer - it contains stranger relatives of aboveground animals, adapted to life underground. From the small, pack-hunting Spike Rats, to the tough Stone Boars and the massive Undertyrants, danger here takes many shapes and sizes. An underground woodland, full of towering fungus. Most of the living creatures here are ambulatory plant-life or fungal-based beings - the few unfortunate enough to die are converted into Moldspawn or Moldslaves by the Amanitarians. Some of the deeper underground tunnels are the habitat of various types of insectoid beings. Few would head down there, fewer still live to tell the tale. The Hive Queens and Swarm Lords bide their time here, seeking to purge the caverns and eventually the surface world of all non-insectoid life. What little remains of once-sprawling underground empires can be found here, in the form of many unnaturally mutated zombies, howling spirits and feral skeletal beings - with several necrophagous beasts moving in, attracted by the scent of decay. The Lords of the Risen, extradimensional demigods, have turned these tunnels into their domain, warding off intruders with their undead minions. 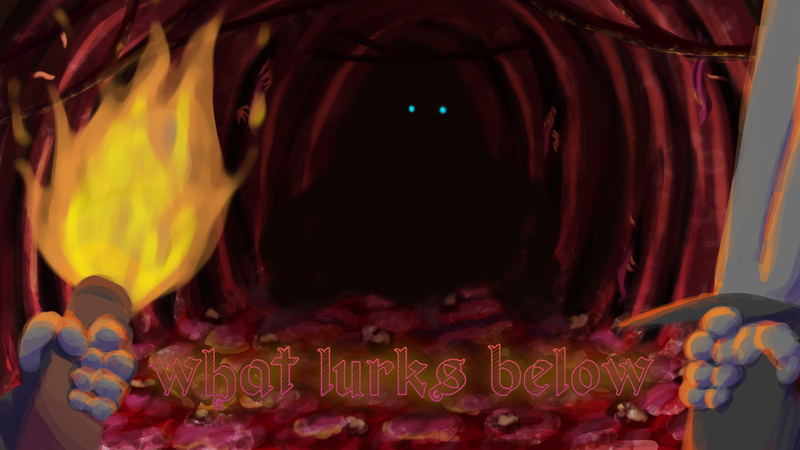 The lowest tunnels are inhabited by many lesser demons and their commanders. Most of those unfortunate enough to encounter them are captured and turned into slaves - even their souls are not safe from being forced to serve - whereas the particularly hated enemies of the demons, such as the dragons, are simply mutilated, driven insane, and left alive to wander the caverns for eternity. Something stirs deep below the earth...An unspeakable yet sickly horror whose mere presence is enough to warp the caverns into an organic, diseased dreamscape. Its minions kidnap those who dwell in the surface world, using their victims as material for creating horrid aberrations of flesh. Now, I haven't included lists of the non-hostile creatures and vermin - you'll have to find out what they are and what they do for yourself! Big thanks to my girlfriend for the banner - she occasionally posts art on her instagram if any of you are interested. Stand-alone version - lacks the vanilla raw changes I made (rearranged some of the underground plants and trees) - you can install it by simple dropping the "raw" folder into your main DF folder. Some of the material, body plan and body detail files are shared with my main pack - you don't actually need those if you're using this alongside my main pack. This looks truly epic! I'll be running that in my next world for sure. Minor hiccup on my part - forgot to carry over a body file which would have produced some errors with one of the creatures - released a fixed version just now. Failed to notice update, sorry. I'm aware - thats why I released the patch earlier, since it includes the file that contained the body plan for them (body_mutant.txt) - I'll change up the material file to remove some of the transformation-syndrome inducing materials too to free up the errorlog so I'll release that soon. EDIT: Alright - added the missing files and removed the unused materials that were causing the issues - errorlog should be free now. Interesting. It certainly reduces the issue of "all first layer caverns the same". (Though the chasm biomes are kind of rare variety.) Pretty neat, overall. I'll download this later. It looks awesome though! Your undead can be butchered and eaten. Assuming this is unintentional, the addition of [CAN_LEARN] and [SKILL_LEARN_RATES:1] , or 0 if the latter can accept it, should correct this. I'm aware - I had plans to add the zombies to an undead race that I have planned for my main pack once the new version comes out (I'd add a compatibility patch for this so they'd have them accessible as pets) - it would have been weird for them to have "jobs" like "diagnostician" and so on. That said if its too odd I can add syndromes to their butchering returns to simulate eating rotten and/or diseased meat. Yeah, admittedly thats an issue I came across, with creatures from the other biome on the same layer wandering onto the map and plant types not entirely respecting the biome restrictions they're given (though SUBTERRANEAN_CHASM plants and trees will be the only ones that show up in those muddy caverns atleast). Thanks! Lemme know what you think! Holy s**t this mod looks amazing. One question...is it compatible with other cavern-expansion mods (Godlysockpuppet's Creepycaverns mod, for instance)? It should, I tagged the internal names for all creatures, body files and so on with prefixes so it shouldn't cause duplication issues. Loving this mod so far. The Land of the Dead biome's "flora" is perfect, and found the fact that your undead can be butchered very amusing when I discovered a dwarf dragging an oozing cadaver to the butcher's shop. The amount of syndrome-causing interactions, even in the first cavern layer, definitely makes caverns more interesting than the occasional crocodile, forgotten beast, or GCS. Considering that these undead are described to be in various stages of decay, adding syndromes to the meat would make sense. I think you do have more than enough sources of syndromes already, though. Glad to hear you're enjoying it then!